Reconnecting with old friends from high school, and discovering that the connections we have between each other are more diverse than we initially thought. Sharing photos with family and friends around the world. Being aware of what our children are talking about and who they are friends with online. Staying informed after the earthquake last year. Who can see what I post? Is what I post searchable online? What if someone posts something I don’t like? Who else can see items I’m tagged in? As anyone who uses Facebook knows, one of the most challenging features is the rapid changes in the privacy and account settings. Here’s a great visual example that clearly demonstrates the changes in privacy policies during 2005 – 2010. Because they’re changing so frequently it can be hard to stay on top of the settings, to make sure you are only sharing with the people you want to share with. So, it’s important to keep checking back to your privacy settings to make sure that they are how you want them. Here’s the tutorial from Facebook (the most likely to be updated), but you can always search for tutorials online as well. You control who sees your posts. You can limit who sees your posts to specific people, or groups of people, just by creating lists or blocking individuals. For example, although I am friends with former students, they can only see what I post on my wall – not what my friends post. This is a simple way to limit who can see what. You control how searchable your Facebook profile is – many parents (and students) have their profiles set to be searchable by Google, but don’t realize they do. The easiest way to check is to log out of all of your various accounts, and then search your own name on Google. If you see your FB profile as a result, click to see if you can actually see your profile (and how much you can see). All of these settings are customizable. You always have the ability to delete posts and comments from your own wall. If someone posts something you don’t like, you can delete it. As you mouse over the comment or wall post, an “x” will appear in the right hand corner of that space. When you click on the “x”, you’ll have the option to delete (or just hide) that post. You can always control what appears on your wall. Facebook has started adding new privacy controls for tagging. Now you can choose to have all photos and comments that you are tagged in “moderated” – meaning you have to approve them before they appear on your wall. This is a great way to stay more informed and aware of what’s being posted about you. Most of your children are on FB. If you are planning to talk to them about how they share and what they share, it helps to have an idea of how it works. If you are not in control of your online presence, someone else will be. This doesn’t mean you have to be constantly updating your profile or checking up on your friends, but it does mean you want to be the one who owns the FB account with your name. And, ideally, you want to see the things you share, the things that positively reflect you, when you Google your name. This is an essential part of having a positive online presence. There are lots of great opportunities for connections, sharing and networking that tools like Facebook make even easier. You never know what opportunities or potentially important information you’ll be able to find by leveraging your network. This is an increasingly important skill in our digital world, and one that we are teaching the students as well. Hopefully this session was an opportunity to explore the potential of social networking tools like Facebook. There are many more available, so we’ll be coming back to this topic again in the future. Our next session will be Wednesday, 2 May from 9:15 – 10:15 in the Loft. Our topic will be Summer Fun with Technology! This will be our last Parent Technology & Literacy Coffee Morning session for this school year. We’ll explore fun and collaborative tools like VoiceThread, GarageBand, blogging, and more to find ways to help your child continue to develop his or her technology skills this summer – and to share the fun you’re having with your family and friends. Hope to see you there! Middle School exams take place next week, April 23rd to 27th. They begin at 9.10am and conclude at 10.40. Students will have a normal school day after their exams. Here is the exam schedule for the week. Grade 6 – English and Maths. *EAL students will not have an exam. The purpose of exams at YIS is to give students experience in studying, reviewing and communicating their knowledge and understanding. It provides students with an opportunity to develop effective study strategies and to work under timed conditions. Our exams in the Middle School focus on the last unit (s) taught and are not a test of all that has been studied over the year. Students are given a general study guide and subject-specific study guides, so they can have a clear expectation of what they will be doing in each exam. Whilst we expect the very best of each student, we want this to be a positive and constructive experience for the students. As they are in middle school, they are able to practise and refine skills in low-stress situations to prepare for high school. We appreciate your support and patience with your child as they face the challenges of next week. If you have any questions or concerns, please contact your child’s teacher or myself. Have you noticed that the amount of homework your child does varies over the course of the year? As a parent of a MS student, it is sometimes hard to keep up with what is due and when. Homework at YIS is an extension of the learning that takes place in the classroom, and is always set with a purpose and is relevant to the material currently being studied. In the Middle School we teach units of work. At the beginning of the unit the teaching is quite specific and much of the work is completed in class, with some homework being set in preparation for the next lesson. An assignment is often set and students will work on this in class and for homework. Assignments can vary in length and complexity. Often an assessment task comes at the end of a unit which students demonstrate their skills, understandings and knowledge. Assessment tasks may also be set during a unit. Units are about 6 weeks long, though can vary in length and most teachers will begin and end a unit at a similar point in the year. You can see how this means that there are very busy times for students, and quieter homework periods at the beginning of the unit when explicit teaching is taking place. We have set up calendars on the teachers blogs so we can all see when assignments are due, and we work as best as we can to balance out students loads. There are peak times in the year, which is the nature of life. Students learn how to manage these and this is an important aspect of middle school as they prepare for high school and increased workloads. It is natural for there to be an ebb and flow of homework, and there are times when your son or daughter may seem like they don’t have much, and times when they feel they have too much. Of course, factors like time management and organization play key roles in students completing work on time. You can find out about major assignments by visiting the calendars that are on the teachers’ blogs. Talking to your child about what they are doing and what homework is important, though sometimes information can be less forthcoming as students become more independent. You can also see a picture of your child’s learning through looking at their blog. You are always welcome to contact your child’s subject teacher if you have any concerns or questions. 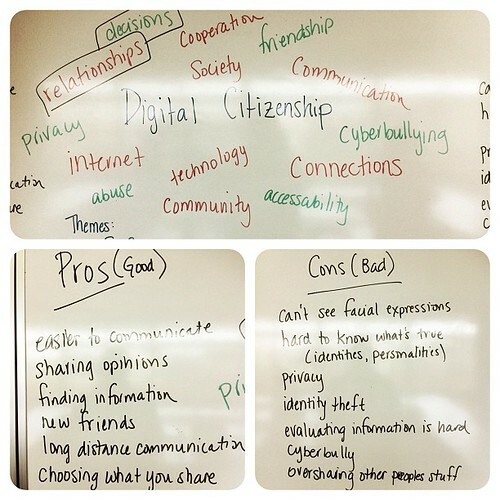 Digital Citizenship Week Coming Up! As part of our Connected Learning Community, we are highlighting the importance of balance, safety and responsible behavior online (generally called “Digital Citizenship”). During the week we will have a variety of activities, including short conversation starters each morning in tutor group, a specialized tutor lesson for the week, and extended sessions with each of the middle school grade levels, all culminating in our MS Assembly on Friday morning. We hope this week will give our students a chance to think about the choices they make, and to reflect on the impact of our first year of the Connected Learning Community. Conversations at home to support the themes of balance, safety and responsible behavior online during the week (and beyond) would be a great way to help build these important understandings.